After publishing my article on how to create a sign-up form, I had a query about how to publicise it. This article tells you how to find the URL for your sign-up form in order to promote and link to the sign-up form in various places on the Web, including your own website, Facebook, etc. Why would I want to publicise my MailChimp sign-up form? 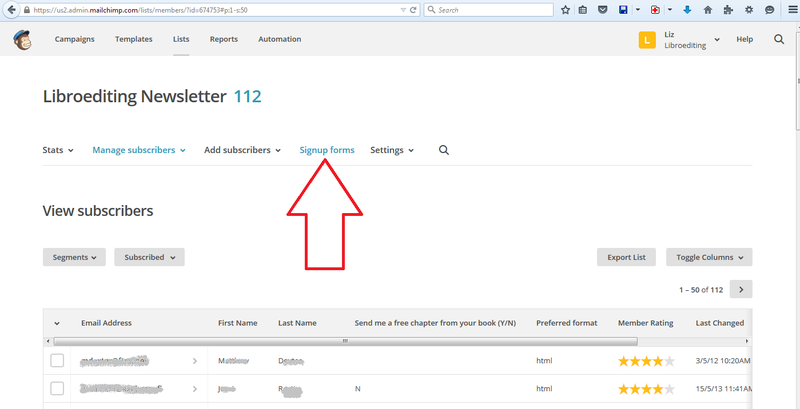 How do I find the URL of my MailChimp sign-up form? The key to all of this is to find the URL or web address of your sign-up form. Every one has it, but it’s hard to find. Here’s how you do it. Now you will find a list of ways to create a form which does not look like the right place. It IS the right place. 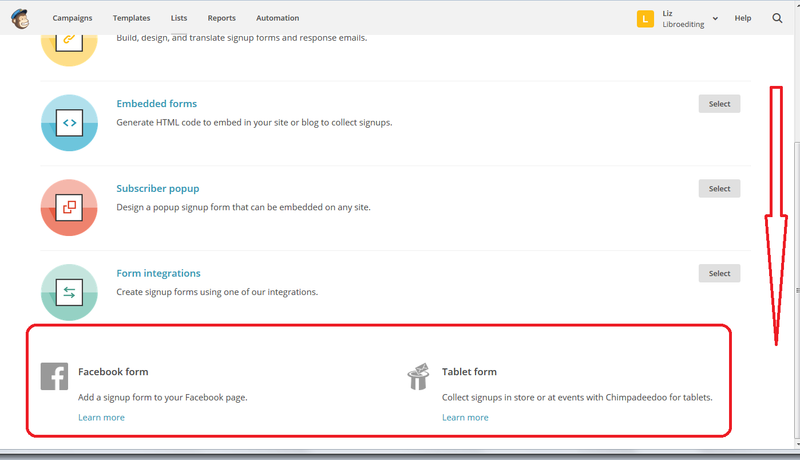 Incidentally, if you scroll down to the bottom of this page, you will find ways to create a sign-up form embedded in a Facebook page or on a tablet, where people can enter their details directly. Both of these options walk you through the process. Although it really doesn’t look like this is the place to go, I know, here you will find your URL! You can copy and paste this URL and put it anywhere on the Web. How do I share my MailChimp newsletter sign-up form on social media and my website? Now you have the URL which links to your sign-up form, you can add that link anywhere you want. In your email signature, use your email service to add a line to every email you send, again, you will probably need the coding above. Everywhere else – share the URL and get people flocking (maybe) to your sign-up form. 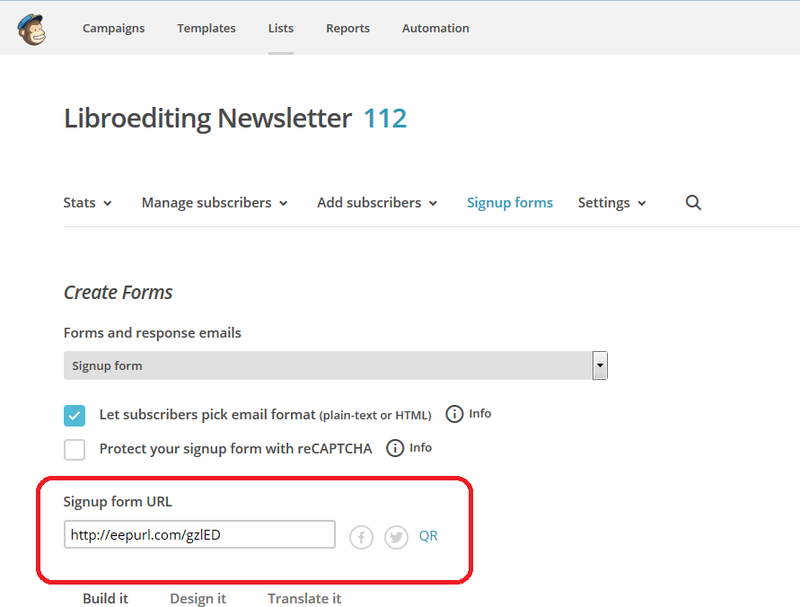 In this article, we’ve learned how to find the URL or web address of your MailChimp newsletter sign-up form in order to share it on the Internet, and talked about how and where you can share it. You can find a growing set of articles on blogging, social media MailChimp etc. in my resource guide. Do click on the share buttons below or comment if you found this article interesting or useful! Thanks so much for adding this extra post! I love how you make everything so easy to see with the screenshots and arrows. It really helps make the steps more clear. You’re welcome – I’m glad I could help! I made a change in my sign up forms & now facebook gives me errors when posting any of my sign up URLs. I even created new ones & still not able to post. Please advise on how I can fix this. I’ve not come across that problem myself, I think the best thing to do would be to contact MailChimp support, including full details of the error message you get.